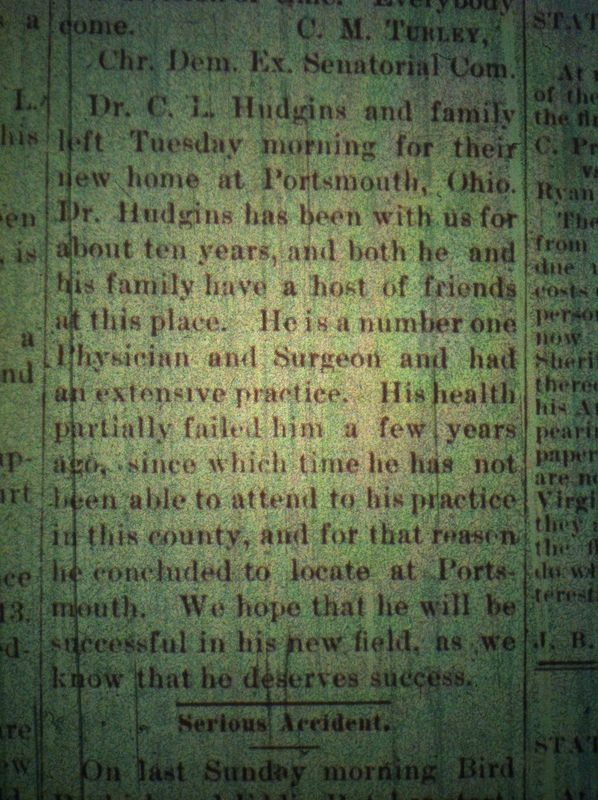 Dr. Cecil L. Hudgins leaves Aracoma, Logan County (WV) Banner, 25 September 1890. Doc Hudgins treated the wound of Hollena Brumfield in September 1889. 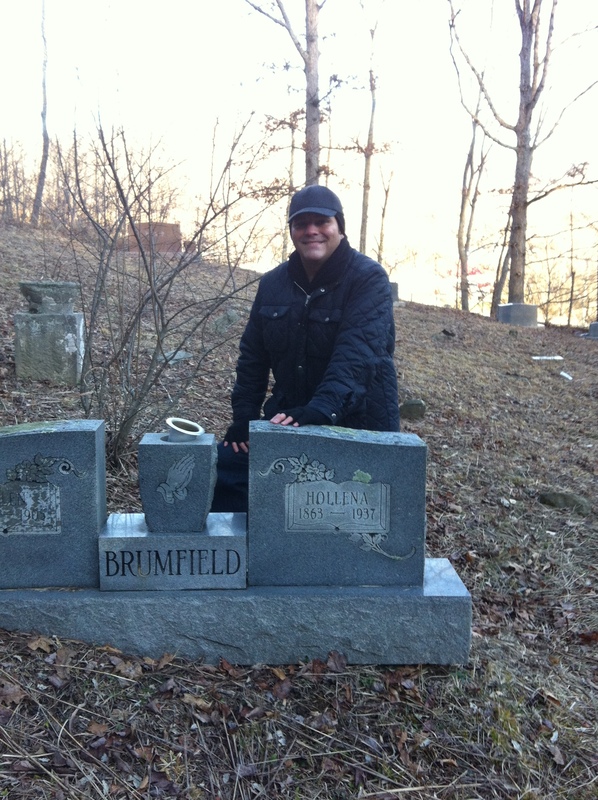 Yesterday, I re-visited the Hollena (Dingess) Brumfield grave in Harts, Lincoln County, WV. Hollena was the daughter of Henderson and Sarah (Adams) Dingess and the wife of Allen Brumfield. Brandon and I also called Bob Bryant, a son of the infamous French Bryant, who lived with his son at the mouth of Piney Creek on West Fork. Billy Adkins had encouraged us to call Bob, saying that he would probably tell us what he knew of the Haley-McCoy murders. When we called Bob, his son said we were welcome to talk with his dad, although he warned us that his memory wasn’t very good. Bob said he was born on Piney in 1911. When I asked him about French Bryant he said he knew very little about him because his dad “was pretty old” when he was born. He said he did remember his father talking “some” about the Haley-McCoy affair. Bob said Hugh Dingess, who was “kind of an outlaw,” organized a posse to fetch Milt and Green after they shot Al and Hollena Brumfield. They found them over around Wolf Creek in Martin County, Kentucky. Some of the others were: Al Brumfield, Charley Brumfield, Fed Adkins, and Burl Farley. Bob never identified his father as a member of the mob but mentioned that his father was a friend to the Dingesses on Smokekouse. He said he remembered seeing Ed play at the schoolhouse above the mouth of Piney when he was nineteen years old. “He was a real fiddler,” Bob said. In subsequent weeks, Brandon and I went through most of our information — processing it, sorting it, discussing it. We thought more about the story of Milt causing Ed’s blindness by dipping him in ice water and wondered how anyone would have ever equated those as cause-effect events. I got on the phone with Dr. Tom Holzen, a doctor-friend of mine in Nashville, who said Milt’s dipping of Ed in ice water, while a little crude, was actually the right kind of thing to do in that it would have lowered his fever. Based on that, Milt seems to have been a caring father trying to save Ed’s life or ease his suffering. Was it the act of a desperate man who had already lost other children to disease? Satisfied that we’d taken up enough of Andy’s day, we drove up Trace Fork to see Wirt Adams, an older brother to Joe Adams. Wirt was busy installing a waterbed but took a break to talk with us. “Well, come on in boys, but I’ve only got a few minutes,” he seemed to say. Inside, however, after I had pulled out my fiddle and he had grabbed a mandolin, he seemed ready to hang out with us all day. I told Wirt that I was trying to find out about Haley’s life. He said old-timers in the neighborhood used to tell stories about Ed playing for dances on Saturday nights with Johnny Hager, a banjo-picker and fiddler. Ed eventually left Harts Creek and got married but came back to stay with his cousins every summer. Brandon wondered about Ed’s tunes. Wirt told us more about Johnny Hager and Ed Belcher. Brandon asked Wirt if he knew the story about how Ed came to be blind. Wirt had only heard “snippets” about Milt’s death. After Milt was caught, he made a last request. From Naaman’s, we drove out of Trace and on up Harts Creek to see Andy Mullins, who Brandon had met a few months earlier at Bill Adkins’ wake. Andy had just relocated to Harts after years of living away in Michigan; he had constructed a new house in the head of Ticky George Hollow. Andy was a son to Roxie Mullins, the woman who inspired my fascination with Harts Creek. Andy, who we found sitting in his yard with his younger brother Dobie, was very friendly. He treated us as if we had known him for years. I liked Andy right away. We all took seats in lawn chairs in the front yard where Andy told about Ed Haley coming to see his parents every summer when he was a boy, usually with his wife. He described him as having a “big, fat belly” and weighing about 200 pounds. Even though Ed was blind, he could get around all over Harts Creek and even thread a needle. Andy had heard that Milt caused Ed’s blindness. “They said that Ed got a fever of some kind when he was a baby and Milt went out and cut a hole in the ice and stuck him under the ice in the creek to break the fever,” he said. Andy knew very little about Milt. “Just that Milt got killed, that was it, over shooting the old lady down at the shoal below Bob Dingess’ at the mouth of Smokehouse,” he said. “All the old-timers that knows anything about his daddy is probably dead,” Dobie said. He also went up in the head of Hoover to see George Baisden, a banjo-picker who’d hoboed with him in his younger days. The two of them had a lot of adventures, like the time Ed caught a train at Dingess and rode it over to Williamson to play for a dance or at a tavern. Just before they rolled into town, George pushed him off the train then jumped off himself. It made Ed so mad that George had to hide from him for the rest of the night. “He played loud, Ed did,” Dobie said. The tune he best remembered Ed singing was “The Drunkard’s Hell”. I wanted to know the time frame of Andy’s memories. Brandon wondered if Ed ever played at the old jockey grounds at the mouth of Buck Fork. Andy doubted it, although it sure seemed to me like the kind of place for him to go. There was moonshine everywhere and men playing maybe ten card games at once. The last jockey ground held at the mouth of Buck Fork was in 1948. I wondered if anybody around Harts played like Ed. Luster tried to remember some of Ed’s tunes. “Way back in them days, they had one they called ‘Cacklin’ Hen’ and ‘Wild Horse’ and such as that on down the line,” he said. I tried to get him to just show me anything — but he refused. He chose instead to talk, starting with how Ed came to visit his father on Big Branch. Luster didn’t know if Milt Haley was a fiddler but had heard the old-timers talk about how either him or Green McCoy had shot Hollena Brumfield through the jaw at the mouth of the Rockhouse Fork on Harts Creek. Sensing that Dorothy had told all she knew about Ed and knowing that she was one-quarter Dingess, we asked her about Milt Haley. Dorothy blamed the trouble squarely on Ben Adams. She said he was a “bully” who wanted to control all the timber on Harts Creek. He hired Milt Haley and Green McCoy to kill Al Brumfield but they accidentally shot Hollena. “And them men that shot them went back in towards Kentucky somewhere and they put out a reward for them,” Dorothy said. Haley and McCoy were soon caught and a Brumfield posse took possession of them. Ben Adams organized a mob to free them at the mouth of Smoke House Fork but the Brumfields were warned by a spy and detoured up Buck Fork and over a mountain to Hugh Dingess’ house. A little later, Brandon visited Lillian Ray, a seventy-something-year-old daughter of Cecil Brumfield who lived in a beautiful two-story house on the Smokehouse Fork of Harts Creek. Lilly, he discovered, had a lot of the old Dingess family photographs. To Brandon’s surprise, there were several thick-paged Victorian velvet-covered albums full of tintypes and a few boxes of sepia images on decorative cardboard squares. Only a few were labeled, but he recognized some of the faces: Al Brumfield, Henderson and Sallie Dingess, Hugh Dingess, Mrs. Charley Brumfield, Mrs. John Brumfield, and Dave Dingess. No doubt, there were pictures in the album of Ben Adams and Hollena Brumfield in their youth. Before leaving, Brandon asked Lilly about Ed Haley. She said she remembered him coming to her father’s house when he lived in the old Henderson Dingess homeplace. He would just show up, leading himself with a cane, and stay for two or three days. Lilly hated to see him come because he was so hateful to the Brumfield children — “always running his mouth.” She described him as a “little short man” who “drank a lot” and told how he and Bernie Adams once borrowed a fiddle from her father and then pawned it off in Logan. The fiddle originally belonged to Tom Martin. Not long after visiting Lilly, Brandon sent me a letter updating me on his research along with pictures of people we’d only imagined. As they turned up, I wondered if I were to go into a room with Al, Paris, Milt, Green, French, Cain, Runyon — without knowing who any of them were — which ones would I take to strictly on a personality basis? Which ones would I have a gut reaction to think, “Well, he’s a pretty fair good old boy,” or, “Boy, I don’t know about that feller there. Something’s just not right.” I mean, you walk in the room and, “That’s Al Brumfield?” No way. “That’s Cain Adkins?” Nope, I can’t believe that. Later in the summer, Brandon visited his friend Pat Adkins, who lived in a little trailer just back of where the old Al Brumfield home once sat at the mouth of Harts Creek. Pat was raised in the magnificent Brumfield house and was its owner at the time of its burning. He was a first cousin to Billy Adkins. Pat first spoke about Al and Hollena Brumfield, who he said charged people a ten-cents-per-log tax at their boom. The tax was a constant source of friction in the community. Even Al’s in-laws weren’t fond of the fee…and apparently weren’t spared from it, either. Brandon asked Pat if the log boom was the root of the 1889 troubles. According to Pat, locals quickly determined that Haley and McCoy were involved in the ambush of Al and Hollena Brumfield and formed a mob to capture them. 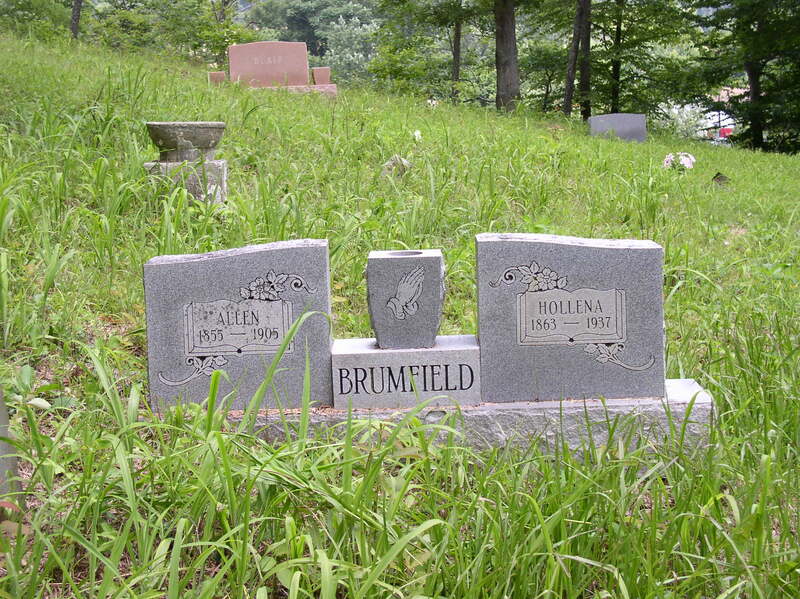 Just before Brandon left Pat, he asked him about growing up in Al Brumfield’s house. Pat said when he was young he often hid behind some large framed Brumfield family photographs stacked in an upstairs room. There was one in particular that he remembered: a picture of Al Brumfield — worn and blind, sitting in a chair on a porch.